Click on the author name to see the abstract. We investigated different kind of π-conjugated molecules in a combined scanning tunneling (STM) and atomic force microscope (AFM). Whereas both measurement channels show features with sub-molecular resolution, the information they can provide is truly complementary. For example, STM allows the direct imaging of the unperturbed molecular orbitals , whereas the AFM channel directly reveals the molecular geometry [2, 3]. 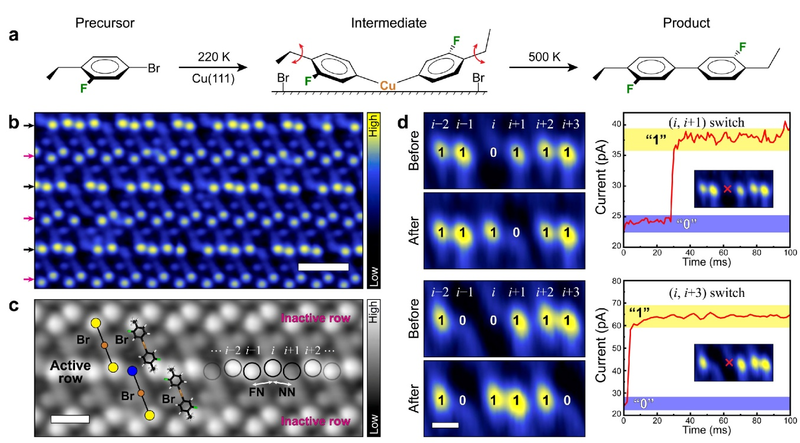 Further, we used the AFM-derived technique Kelvin probe force spectroscopy (KPFS) with sub-molecular resolution to image the polarity of individual bonds inside a single molecule . The possibility of tailoring optical waveforms has allowed scientists to steer ultrafast electronic motion directly via the oscillating carrier wave of light - a principle dubbed "lightwave electronics" . Despite tremendous interdisciplinary efforts to combine ultrafast temporal resolution with atomic spatial resolution, the ultrafast dynamics of individual molecular orbitals has remained out of reach. Terahertz (THz) scanning tunnelling microscopy  (THz-STM) has introduced a new paradigm by combining STM with lightwave electronics. In THz-STM, the electric field of a phase-stable single-cycle THz waveform acts as a transient bias voltage across an STM junction. In analogy to the all-electronic pump-probe scheme introduced recently in STM  these voltage transients may result in a net current that can be detected by time-integrating electronics. By means of a low-noise low-temperature lightwave-STM we entered an unprecedented tunnelling regime, where the peak of a terahertz electric-field waveform opens an otherwise forbidden tunnelling channel through a single molecular orbital. 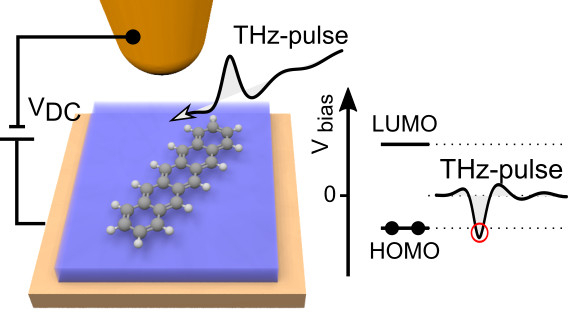 In this way, the terahertz peak removes a single electron from an individual pentacene molecule's highest occupied molecular orbital within a time window of ∼ 100 fs - faster than an oscillation cycle of the terahertz wave. This quantum process allowed us to capture a microscopic real-space snapshot of the molecular orbital on a sub-cycle time scale. By correlating two successive state-selective tunnelling events, we directly tracked coherent THz vibrations of a single molecule in the time domain . Figure 1: Schematic representation of the lightwave-STM setup, in which the THz-pulse acts as a bias transient. J. Repp et al., Phys. Rev. Lett. 94, 026803 (2005). L. Gross et al., Science 325, 1110 (2009). F. Albrecht et al., JACS 137, 7424 (2015). Molecular devices are capable of performing a number of functions from mechanical motion to simple computation. Their utility is somewhat limited, however, by difficulties associated with coupling them with either each other or with interfaces such as electrodes. Self-assembly of coupled molecular devices provides an option for the construction of larger entities that can more easily integrate with existing technologies. We demonstrate that ordered organometallic arrays can be formed spontaneously by reaction of precursor molecular rotor molecules with a metal surface. Scanning tunneling microscopy enables individual rotors in the arrays to be switched and the resultant switches in neighboring rotors imaged. The structure and dimensions of the ordered molecular rotor arrays dictate the correlated switching properties of the internal sub-molecular rotor units. Our results indicate self-assembly of 2D rotor crystals produce systems with correlated dynamics that would not have been predicted a priori. These are highly emergent properties because individual, isolated molecular rotor units show random rotational behavior, whereas when coupled together in a self-assembled 2D crystal, correlated rotational switching is observed that would not have been predicted from the behavior of the individual units. The systems reported here are operated at low temperature, however, the barriers could be tuned via the design of the molecules themselves. While a lot is known about structure-function relationships in 3D crystals, 2D crystal engineering is still in its infancy. Moving forward, by measuring the properties of 2D crystals and then making subtle changes with organic synthesis, structure-function relationships can be drawn and emergent properties, like in this case correlated rotor switching, understood. This approach provides a new direction for the field of molecular machines, which while having produced a variety of single molecule devices, lacks ways to couple molecular motion between units and perform higher tasks. Figure 1: Correlated switching in self-assembled molecular rotor crystals. Submolecular imaging using frequency-modulation (FM) atomic force microscopy (AFM) has recently been established as a stunning technique to reveal the chemical structure of unknown molecules, to characterize intra-molecular charge distributions, and to observe chemical transformations. So far, most of these feats were achieved on planar molecules using the so-called qPlus sensor, a specially designed quartz AFM sensor. Here, we report a novel imaging method using multi-pass routine to achieve submolecular resolution on three-dimensional molecules and structures with a silicon (Si) cantilever-based AFM operated with large oscillation amplitudes. At variance with previous implementations, this method allows us to simultaneously image both intra-molecular structures and the atomic arrangement of the substrate . Force volume measurements over C60 molecules clarify the validity of our method to achieve submolecular resolution. Using this technique as well as information obtained in our previous study of clean anatase TiO2(101) surface , we have investigated adsorption of pentancene molecules on terraces and steps of anatase TiO2(101) . Based on comparison with theoretical calculations, we obtain an insight into substrate-molecule interaction and probe tip termination. 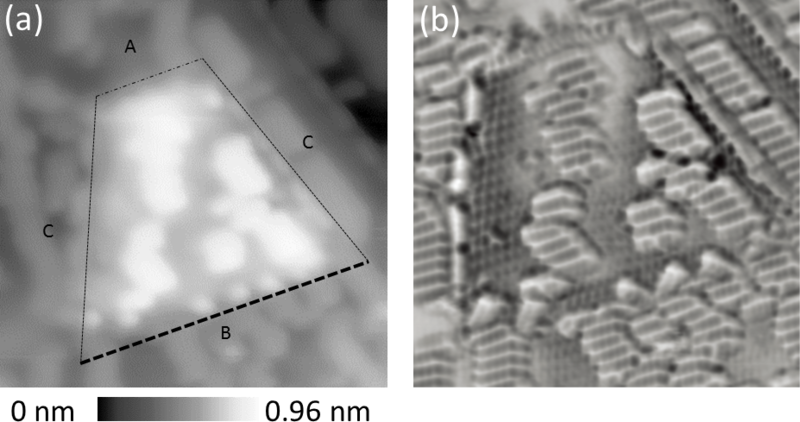 Figure 1: (a) Topographic AFM image and (b) multi-pass frequency shift image of pentacene molecules adsorbed on terraces and steps of the anatase TiO2(101) surface obtained at 77 K. Image size is 20nm×20nm. C. Moreno et al., Nano Lett. 15, 2257 (2015). O. Stesovych et al., Nat. Commun. 6, 7265 (2015). M. Todorovic et al., in preparation. The adsorption of functionalised organic molecules on insulating surfaces plays an important role for many applications. However, studies so far have mainly focussed on the enthalpy of adsorption and uncertainties still remain about entropic contributions. Recent theoretical studies on the adsorption of individual flexible and rigid molecules on the KCl (001) surface have shown significant entropy loss during adsorption. In this work we present data on molecular adsorption and diffusion of large organic molecules on terraces and step edges on the insulating KCl (001) surface, specifically focussing on the effects that molecular flexibility has on their dynamic behaviour and what implications that may have on self assembly. Two functionalised organic molecules, 1,3,5-tri- (4-cyano-4,4biphenyl)-benzene (TCB) and 1,4-bis(cyanophenyl)-2,5-bis(decyloxy)benzene (CDB), were studied on the KCl (001) surface using density functional theory (DFT) and classical molecular dynamics (MD) simulations. MP2 calculations were used to benchmark the performance of Van der Waals corrected DFT-D3 calculations of adsorption energies and geometries and a classical force field was parameterised for each of the molecules using a genetic algorithm. These force fields allowed us to perform long time-scale simulations to study the motion of molecules on the free energy surface. In order to better understand adsorption of TCB and CDB molecules at non-zero temperatures, potential of mean force calculations were employed. It was found that entropic contributions significantly lower the adsorption free energy, which facilitated desorption. Furthermore, adhesion to step edges was investigated along with the associated change in entropy. While the flexible CDB molecule can readily adapt to step edges, the rigid TCB molecule is unable to and exhibits a significant entropy loss upon step adhesion. We show that the simple rigid rotor model can accurately estimate entropy loss upon step adhesion for TCB but fails for CDB. These results highlight how molecular flexibility directly influences surface dynamics, which can lead to different self-assembly growth modes. Gaberle J., Gao D. Z., Watkins M. B., and Shluger A. L., Calculating the entropy loss on adsorption of organic molecules at insulating surfaces, J. Phys. Chem. C 120, 3913-3921 (2016). Gao, D. Z., Federici Canova, F., Watkins, M. B., and Shluger, A. L.,Efficient parametrization of complex molecule-surface force fields, J. Comp. Chem. 36, 1187-1195 (2015). Quantum dot (QD) arrays on surfaces, generated through molecular self-assembly processes, have so far provided researchers with a vast playground to study the electronic properties of new and exotic 2D materials in ultra-high-vacuum (UHV) conditions. By selecting the proper molecular constituents (tectons) and substrate, long-range ordered, periodic and robust nanoporous networks have been achieved, ranging from hydrogen-bonded to metal-organic structures . Not only do they stand out as ideal templates for nanopatterning, but also as adequate candidates for studying fundamental physical phenomena such as confinement through the scattering of two-dimensional electron gases (2DEGs). Indeed, confinement tunability has already been accomplished by varying the pore (i.e. quantum dot) dimensions, geometrical shape and molecule substrate interactions [2,3]. In addition, inter-dot coupling has been shown by photoemission through the generation of new dispersive bands  that can be modulated through thermodynamics  and the condensation of guest elements (Xe atoms) . To date, the modification of 2DEGs through inter-dot barrier width variations has not been experimentally demonstrated. Herein, sustained upon a combination of local scanning probes (STM/STS/AFM), angle resolved photoemission spectroscopy (ARPES) and extended model calculations, we show that we can precisely engineer the inter-dot barrier width by substitution of a single atom in a haloaromatic compound. As a result, we tune the confinement properties at each nanopore affecting the degree of QD intercoupling both on bulk and thin Ag films alike. These findings pave the way to reach full control over 2DEGs with the prospect of becoming key for future electronic devices. 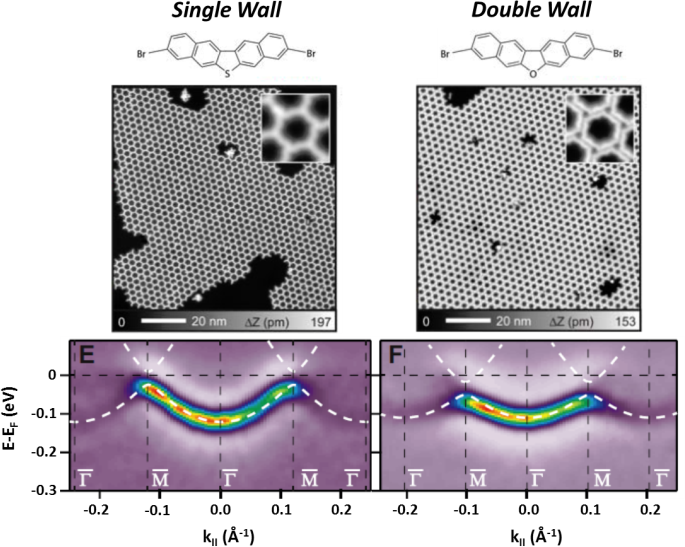 Figure 1: Inter-dot barrier width engineering: single vs double molecular walls that tune the QD intercoupling properties. Here we will present experimental evidence of controlling multiple charge states on a single 3,6,3',6'-tetraferrocene-9,9'bis-fluorenylidene, deposited on thin insulating NaCl film, by means of nc-AFM. We succeed to control the multiple charge states including their reversible transfer within a single molecule between different redox states. The induced charged states have prominent fingerprints in both the frequency shift and dissipation channels. Moreover, we demonstrate that the charge states can be modified by presence of neighboring charged molecules. The experimental evidence is corroborated with a theoretical model simulating response of a dynamically oscillating AFM probe to temporal changes of force due to the charging effects of molecules on surface. 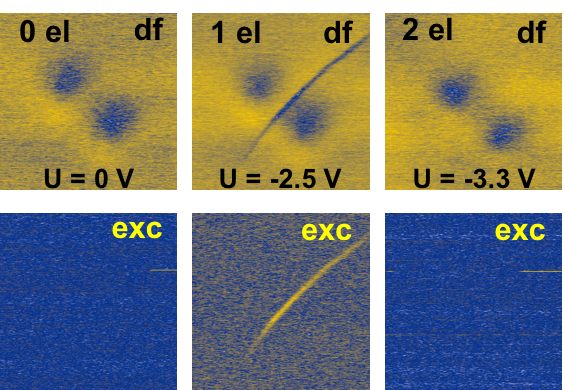 Figure 1: Frequency shift and dissipation signal images acquired for neutral, one and two-electron charge states of bis-ferrocene deposited on NaCl substrate. 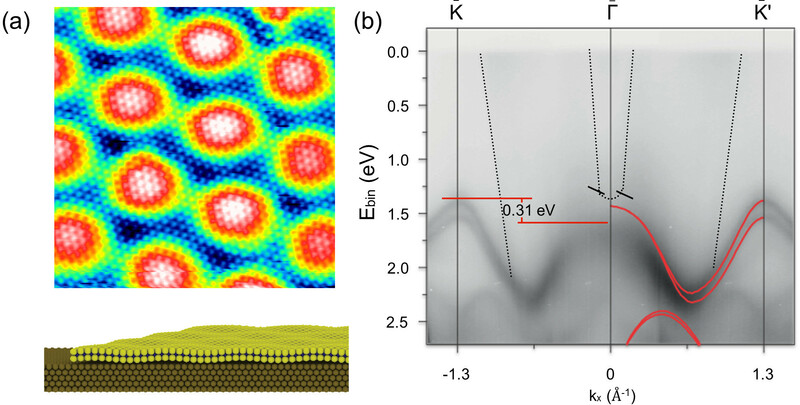 Figure 1: (a) Atom-resolved STM image showing the atomic lattice and moiré pattern of MoS2/Au(111) (b) Photoemission results along the Γ-K direction for MoS2/Au(111). S.G. Sørensen, H.G. Füchtbauer, A.K. Tuxen et al., ACS Nano 8, 6788 (2014). S.S. Grønborg, S. Ulstrup, M. Bianchi et al., Langmuir 31, 9700 (2015). J.A. Miwa, S. Ulstrup, S.G. Sørensen et al., Phys. Rev. Lett. 114, 046802 (2015). 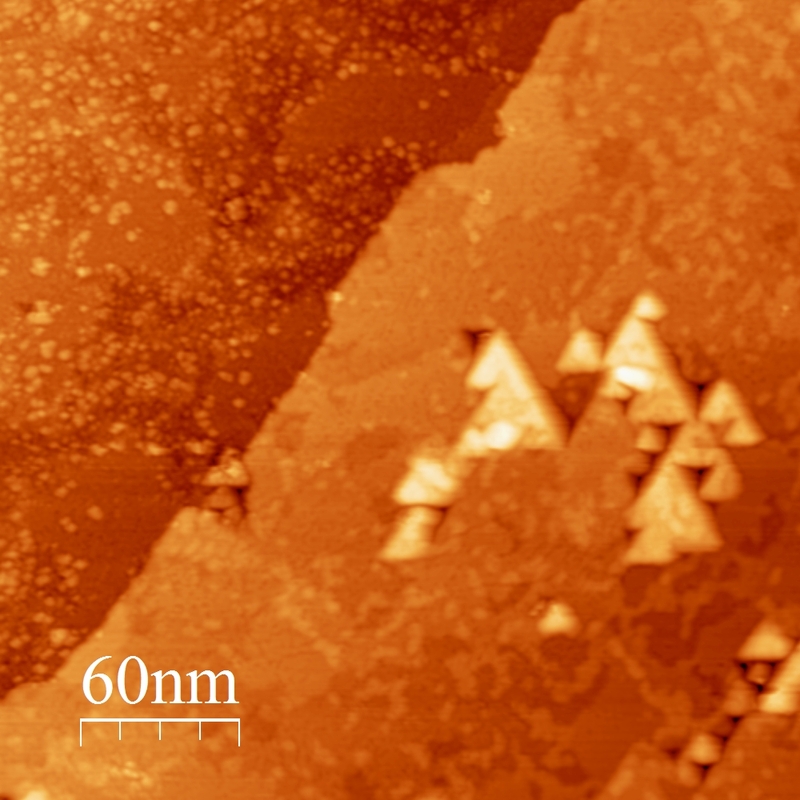 Two-dimensional (2D) nanocrystals of molybdenum disulphide (MoS2) are grown on the substrate strontium titanate (SrTiO3) by chemical vapour deposition (CVD). MoS2 is an indirect-bandgap material in its bulk form, and exhibits an indirect-to-direct transition when thinned to a monolayer. It also possesses metallic edge states due to the shape finiteness. As a 2D material, MoS2 is highly sensitive to its substrates, so engineering the substrate is an important step to be able to manipulate it and fully realise its potentials. However, it has only been studied on very few substrates, e.g. Au  and Si/SiO2 . In this project, nanocrystals of MoS2 are grown on reconstructed SrTiO3 surfaces. 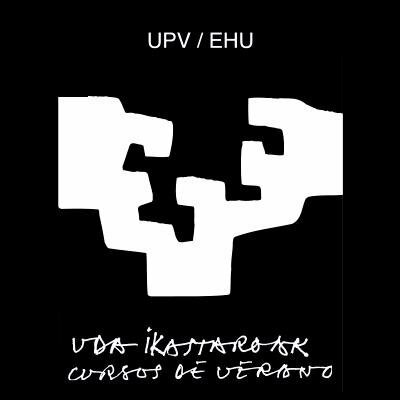 The new substrate is crystalline and each crystal surface (e.g. (111) and (110)) has a wide range of surface reconstructions [3,4], which were prepared by high-temperature annealing (800-1200°C) in either ultra-high vacuum (UHV) or partial pressures of oxygen. Their near-atomic structures were imaged by scanning tunnelling microscopy (STM). The different surfaces possess different lattice constants and surface energies, which could influence the epitaxy of the nanocrystal growth. The structural, electronic and optical properties of MoS2 grown on SrTiO3 are being characterised by STM, ultra-high vacuum (UHV) scanning electron microscopy (SEM), photoluminescence (PL) and Raman spectroscopy. The good epitaxial relationship between MoS2 crystals and SrTiO3 has been noted by SEM and STM (Figure 1), the latter of which also recorded the atomic structure and Moiré patterns of MoS2. PL and Raman results confirmed the monolayer thickness of the crystals and their good optical properties. They also provided information on the strain and doping levels in the nanocrystals induced by the substrate. It is expected that the new substrate will result in interesting new properties of dichalcogenides and help us explore their new applications in 2D nanodevices. Figure 1: Figure 1: STM images of MoS2 nanocrystals (bright triangles) on SrTiO3(111). M. Buscema et al., Nano Res. 7, 561(2014). S. Bhattacharjee et al., IEEE Trans. Electron Devices 63, 2556(2016). B. Russell et al., J. Phys. Chem. C 112, 6538(2008). B. Russell et al., Phys. Rev. B 77, 245414(2008). Recently, a few research groups have reported the growth of germanene, a new member of the graphene family . 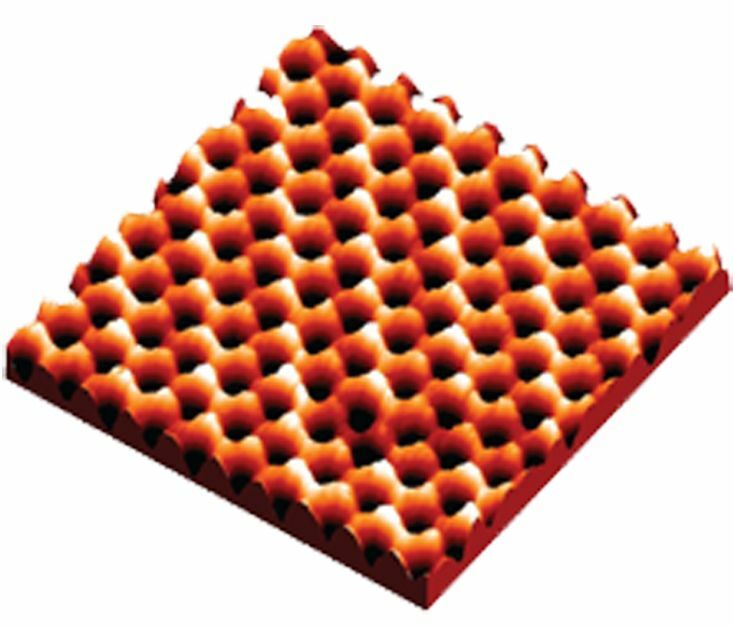 Germanene is in many aspects very similar to graphene, but in contrast to the planar graphene lattice, the germanene honeycomb lattice is slightly buckled and composed of two vertically displaced sub-lattices. Frist principles total energy calculations have revealed that free-standing germanene is a two-dimensional Dirac fermion system, i.e. the electrons behave as massless relativistic particles that are described by the Dirac equation, i.e. the relativistic variant of the Schrödinger equation. We will give a brief update of the growth and electronic properties of germanene on Pt/Ge(110) nanocrystals [2,3]. Subsequently, we will show that large and continuous single germanene layers can be grown on molybdenum disulfide (MoS2) . The structural and electronic properties of the germanene layer are studied with scanning tunneling microscopy and spectroscopy. The lattice constant of the germanene layer is 3.8 ± 0.1 Å , i.e. substantially larger than the lattice constant of MoS2 (3.16 Å), and the interlayer distance between the germanene layer and the MoS2 substrate is 3.2 ± 0.2 Å, suggesting that we are dealing with a low-buckled germanene layer. The density of states of the germanene layer exhibits a V-shape, which is reminiscent for a two-dimensional Dirac system. The minimum of the density of states is located near the Fermi level. Figure 1: Scanning tunneling microscopy image (4.5 nm by 4.5 nm) of buckled honeycomb lattice of germanene. Sample bias -0.5 V, tunnel current 0.2 nA. A. Acun et al., J. Phys. Cond. Mat. 27, 443002 (2015) and references therein. P. Bampoulis et al., J. Phys. Cond. Mat. 26, 442001 (2014). L. Zhang et al., Phys. Rev. Lett. 116, 256804 (2016). n this contribution I will provide a description of the oxygen intercalation at the strongly interacting graphene on Ni(111) and of the role of rotated graphene domains in triggering the intercalation. The system was studied by a combination of high-resolution x-ray photoelectron spectroscopy (HR-XPS), photoelectron diffraction (XPD) and angle-resolved photoemission (ARUPS) performed with synchrotron radiation. The HR-XPS measurements provided a full characterization of the interface at each stage of the intercalation, revealing the formation of an oxide layer between graphene and the metal substrate. The ARUPS data showed that the oxide layer efficiently decouples graphene from the substrate, restoring the Dirac cone and providing a slight n-doping. The C1s XPD measurements revealed that the graphene domains not aligned with the Ni substrate are the first to be intercalated with oxygen. At the same time, these domains are also preferential regions under which the oxygen is retained during the deintercalation process.